When it comes to choosing ceiling fans, most homeowners rely solely on style and price. At M&M Lighting in Houston, our experts believe that there’s more important qualities to consider when it comes to choosing what ceiling fans to install in your home. Our specialists have first-hand industry experience when it comes to identifying the most important elements in a fixture, including motor quality, airflow, blades and efficiency. If you need help choosing the best ceiling fans for your needs and budget, contact our experts today! Aside from a ceiling fan’s design and look, there are three major components of a ceiling fan: the motor, blades, and controls. Understanding each of these critical components will help you to choose the best ceiling fan for your home and application. The motor size of a ceiling fan is critical to its overall functionality. If you purchase a ceiling fan with an undersized motor, it can make your fan less efficient which can lead to higher energy bills. In order to ensure the fan you’re looking to purchase has a good motor, take a look at the warranty. For many high-quality ceiling fans, the manufacturer will back up the product with a motor warranty. While there are several different types of motors, below are some of the most popular. One popular motor type for ceiling fan motors is a die-cast aluminum motor. These motors offer a long lifespan due to their lower operating temperatures which are achieved through their aluminum body enclosure. If you’re looking for a ceiling fan motor that offers superior air movement, this may be the perfect fit for you. Did we mention these motors are virtually noise-free? These motors have engineered bearings to provide the lowest amount of resistance and friction when operating, making them extremely quiet. Stamped steel motors offer excellent air movement as well, with a smooth and quiet operation. Available in a variety of sizes including large, medium, and small, these motors also have a long lifespan. At M&M Lighting, our experts are well-versed in the various fan motor types available, and we would love to answer any questions you may have. 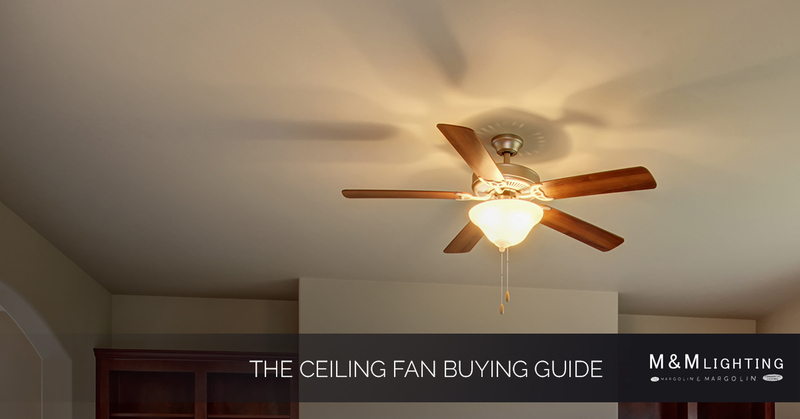 One of the most important things to consider when buying a ceiling fan is its size. If you purchase a fan for your bedroom that is too small, it could look and feel out of place. On the other hand, if you buy a fan that is too large for the space, you could be wasting a ton of energy. Ceiling fans are most often measured based on the total length of their diameter, from the edge of one blade to the edge of another. If your bedroom is less than 80 square feet, a 32-inch fan will serve you well. If you have a large bedroom between 120- and 144-square feet, you should consider a larger fan, such as a standard 52-incher. 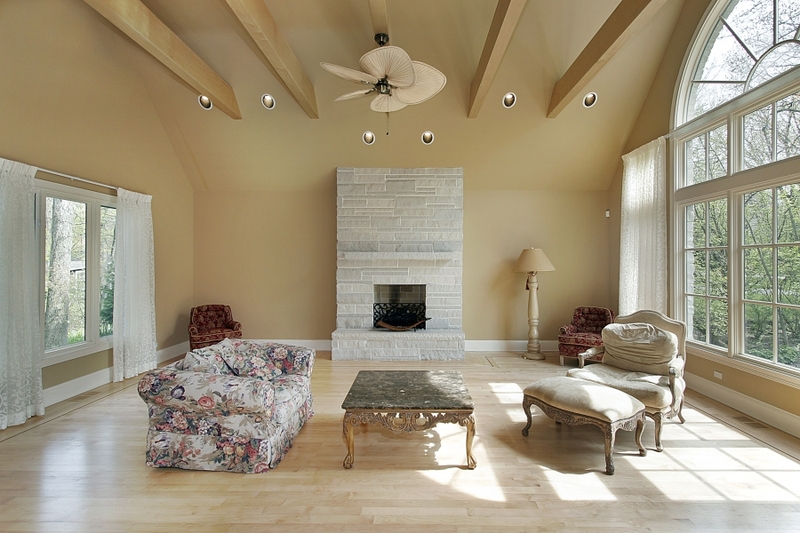 The height of your ceiling should also play a role in your ceiling fan decision. For the most efficiency, install your fan so its blades are eight feet from the floor. Another major factor to consider before purchasing a new ceiling fan is airflow. There are several different factors that can go into your fan’s airflow performance. We’ll dive deeper into these factors below. Blade pitch can be defined as the angle at which your ceiling fan blades are situated as they move through the air. A good way to picture this is by imagining the blades of a fan as if they were the oars of a rowboat. When the blades are flat or horizontal to the surface of the water, it takes very little force to move them. As you tilt the blades at a steeper angle, they will become progressively harder to row. Without an increase in force, you’ll have to work even harder to move the boat when your blades are at an angle. This logic can also be applied to your ceiling fan’s blades in terms of air movement. Fan blades that have a relatively flat pitch, between 10 and 12 degrees, will not require a very big motor to reach high speeds. Fans that feature a steeper blade pitch, such as 14 to 15 degrees, will require a more powerful motor to achieve the same speed. In order to find the best ceiling fan for your home, it’s important to ensure the pitch of the blades and the power of the motor complement one another and not work against each other. At M&M Lighting in Houston, we’re proud to offer some of the best ceiling fans and lighting solutions to our clients. If you’re interested in learning more about our ceiling fans or you have questions about any of the models on our website, contact us today!